[John Callcott Horsley, RA, painter.] Autograph Letter Signed ('J. C. Horsley.') to 'Archdeacon Farrar' [Frederic William Farrar], asking him to officiate at the wedding of his daughter Fanny to Dr Arthur Whitelegge. On letterhead of High Row, Kensington, W. [London] 31 January 1885. 4pp, 12mo. Bifolium of grey paper. In good condition, lightly aged. [ Victorian matchmaking: 'consult me personally & see cartes of 500 Ladies'. ] Two Autograph Letters Signed (both 'Editor | M N') and printed agreement from the editor of Matrimonial News to J. Russell Gubbins of Limerick, who is in search of a wife. The two letters from the Matrimonial News Office, 282 Strand, London. 11 and 13 February 1874. A marvellous slice of Victorian social history. The entry for 'Matrimonial News' in 'Frederick May's London Press Dictionary and Advertiser's Handbook, 1871' runs as follows: 'MATRIMONIAL NEWS AND SPECIAL ADVERTISER – 2d. F. Farrah, 282, Strand, W.C.
[ Mona Caird, Scottish novelist and suffragist: 'my power of immediate help was nil'. ] Autograph Signature to last two pages of a letter explaining her inability to help the recipient, due to her 'financial matters' being 'black'. 2pp., 12mo. The final two pages of an autograph letter by Caird, signed along a margin on the penultimate page: 'Yours sincerely | Mona Caird'. In fair condition, lightly aged and worn. 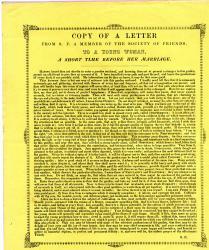 The letter reads: '[…] I received your letter I knew too that my power of immediate help was nil. 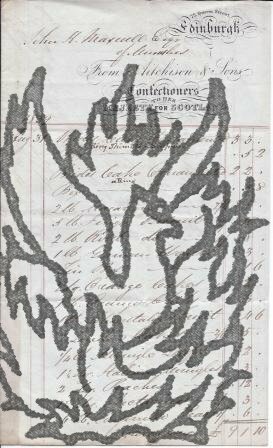 My expenses at the time were swelling out of all expected proportion & financial matters looking black all round in consequence of the state of things in Australia | You cannot imagine too what an infinite number of appeals I receive for help. For some time I shall be utterly unable to give any substantial aid. [ Printed pamphlet, with introduction by G. W. Foote. ] Marriage and Divorce. An Agnostic's View. By Colonel R. G. Ingersoll. London: Progressive Publishing Company, 28, Stonecutter Street, E.C. [ Printed and Published by G. W. Foote, 28 Stonecutter St., London, E.C. ] 1890. 15 + pp., 12mo. Disbound without wraps. In good condition, with light signs of age. Last page carries a list of 'Works by Colonel Ingersoll.' Foote's introductory note reads: 'During November and December, 1889, the North American Review printed a number of articles by representative men on the subject of Divorce. The editor framed a series of four questions, which the various writers replied to. Colonel Ingersoll answered them seriatim and fully, without the least evasion and reserve, having a habit, not only of meaning what he says, but of saying what he means. [ Rev. Robert Anderson Jardine, the man who married the Duke and Duchess of Windsor. ] Album of newspaper cuttings and other material, with signed note on front cover: 'PROTESTANT CUTTINGS | PAMPHLETS & general items: | R. Anderson Jardinee'. Cuttings dating from 1910 and 1911, and 1930. Jardine, dubbed by the press 'the Poor Man's Pastor', travelled to France to perform the ceremony. As a result, his vestry committee resigned and he resigned his living, emigrating to the United States. The cuttings are laid down on 19pp of a Victorian folio volume, in superior brown calf binding, tooled in gilt, with marbled endpapers, and 'HARMONY OF THE GOSPELS' stamped on the spine. As the title on the spine indicates, the volume contains the manuscript of a harmony of the gospels, covering 127pp, with the text written around columns of printed text cut from a printed bible. 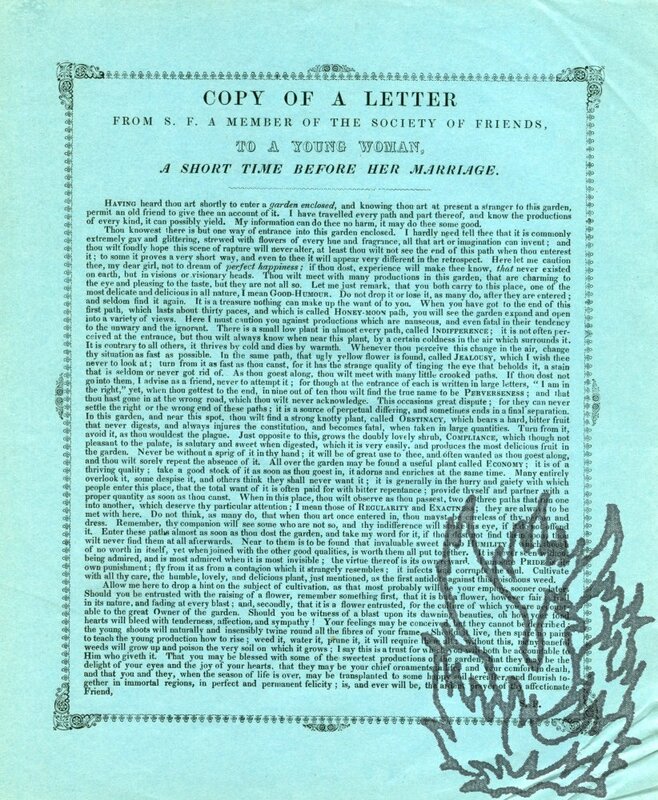 [Female suffrage; printed pamphlet.] Marriage-Law Injustice, Objections to the Divorce Act, with Suggested Amendments. Manchester: Palmer & Howe, Bond Street. 1876. 24pp., 8vo. In good condition, lightly-aged, no wraps, disbound. Copies in copyroight libraries. None on market currently. 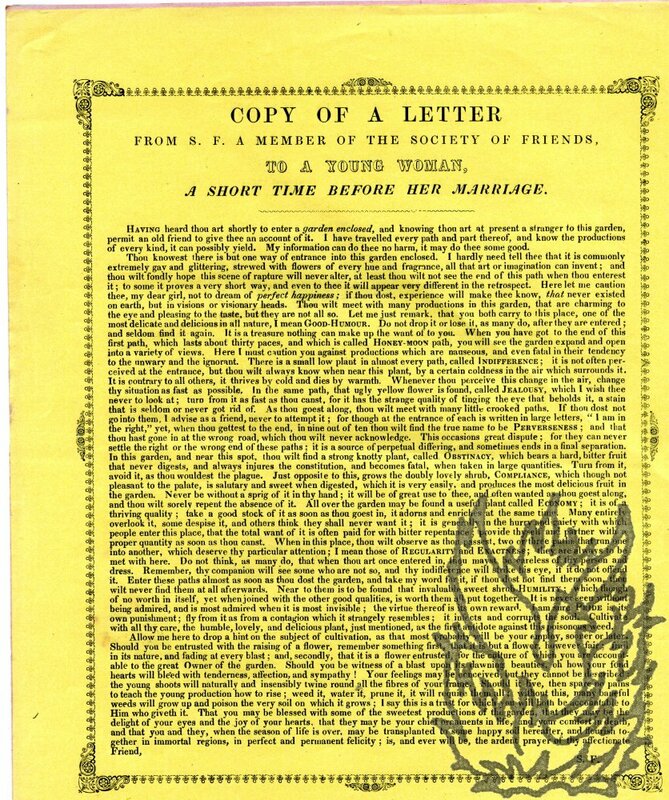 [Female suffrage; printed pamphlet.] The Injustice of the English Law as it bears on the Relationship of Husband and Wife. 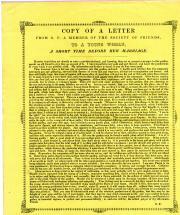 An Essay Read in the Law School at Cambridge in November, 1867. 'Reprinted, by the kind permission of the Proprietors, from "THE CONTEMPORARY REVIEW."' ['Frederick Bell & Co., Steam Printers, King's Road, Chelsea.'] Undated [circa 1867]. 16pp., 8vo. In good condition, lightly-aged, no wraps, disbound. Only one copy on COPAC, at the British Library. There was a second edition, published by Virtue & Co., London, in 1874. 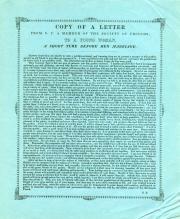 [Female suffrage; printed pamphlet.] On the Forfeiture of Property by Married Women. 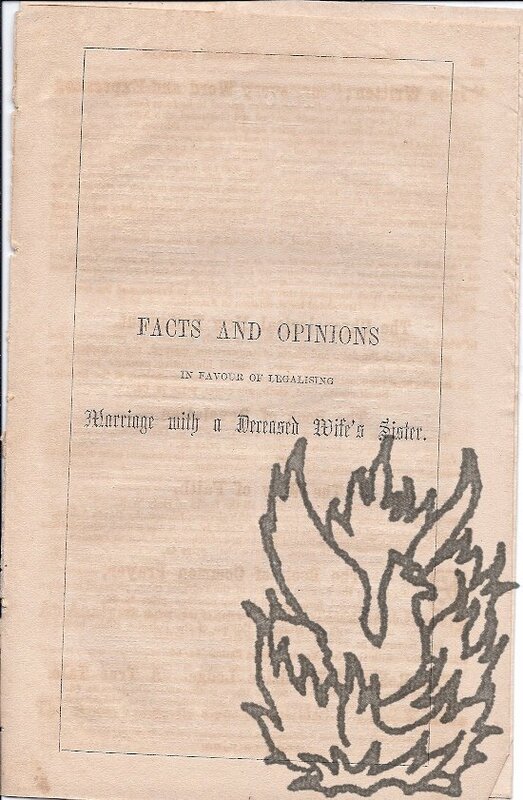 [Reprinted, by kind permission, from the FORTNIGHTLY REVIEW, for the Committee in support of MR. RUSSELL GURNEY'S MARRIED WOMEN'S PROPERTY BILL.] With an Appendix. Manchester: A. Ireland & Co., Printers, Pall Mall. 1870. 16pp., 8vo. In good condition, lightly-aged, no wraps, disbound. Several copies on COPAC, none of this edition on market currently. 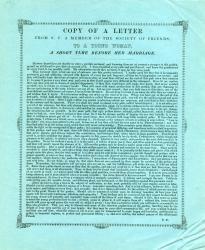 [Printed pamphlet in the form of a poetical dialogue regarding a parliamentary bill to legalise marriage to a deceased wife's sister.] Sisters-in-Law. A Conversation between two Peers. 'London: R. Clay, Sons, and Taylor, Printers, Bread Street Hill'. Undated [London: Edward Stanford, 1871]. 15 + pp., 8vo. Drophead title. In good condition, lightly-aged, no wraps, disbound. Poetic dialogue in Tennysonian blank verse, beginning: 'First Peer. - This measure, every session comes to pass | By large majorities the Lower House; | And every year, of course, we throw it out, | But only by a bare majority. [title continued] "!To which is added the Registration of Births and Deaths | The Whole including Marriage | Breach of Promise | Husband and Wife | Settlements | Parent and Child | Registration." pp.iv.188 (additional 3 pages of advts, inc.inside back cover), limp cloth binding, attractive cover with some use of colour (see scan), covers stained, contents good. A surprisingly scarce book, only two copies listed on COPAC (Oxford and Cambridge). Manuscript copy of 'Form of a Muhammedan Divorce' between 'The respectable Ahmed Ibn Ali' and his wife 'Madam Fattoumeh Bent Muhammed'. In English and Arabic. Folio, 2 pp. The English on the recto of the first sheet, and the Arabic on the reverse of the second. Text clear and complete. On aged and worn paper. Begins: 'Praise be to God. | And thereupon The respectable Ahmed Ibn Ali divorced his wife Madam Fattoumeh Bent Muhammed, now absent from divorce meeting and from it's [sic] country (i.e. 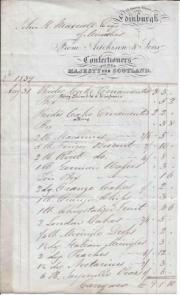 Six manuscript bills and one letter from Edinburgh and Dumfries tradesmen, relating to the 1839 marriage in Buittle Parish of Janet, daughter of John Herries Maxwell of Munches, to William Maxwell of Carruchan. Janet Maxwell married William Maxwell in Buittle Parish on 3 September 1839, and died three years later. The nine items, in good condition on lightly-aged paper, provide a fascinating insight into the requisites and cost of an early Victorian Scottish middle-class wedding, from the wedding 'pelisse' to the 'bride's cake'. ONE. Covering packet with manuscript note by J. H. Maxwell reading 'Vouchers | My Daughters marriage - clothes jewellery pocket money &c | 3d Sep 1839 | £439. 5. 4'. TWO. Autograph itemised account by J. H. Maxwell. 12mo, 1 p.
Typed copy, with annotations, of depositions in the case Rex v. Mir Anwaruddin, heard at the Central Criminal Court, 1918, following a libel action against Horatio Bottomley. 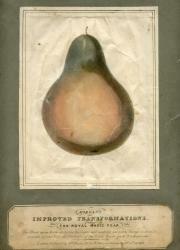 For 'Director of Public Prosecutions [Sir Charles Willie Mathews]'. Folio, [i] + 49 pp. Text clear and complete. A mimeographed typescript, with text and manuscript annotations. Clear and complete, on aged and creased paper. Typed in bottom right-hand corner of covering title: 'Director of Public Prosecutions.' Anwarudding was called to the bar at Lincoln's Inn in 1913, and between that year and 1918 his marital difficulties caused him to appear before thirteen different High Court Judges in eight different courts. 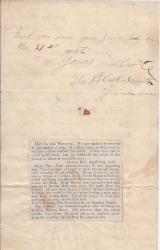 Autograph Note Signed "The Blacksmith of Gretna Green" to unnamed correspondent. "The Blacksmith of Gretna Green". "Gretna Hall | April 10th 1852". Two pages, 12mo, some creasing and staining, and a few wards faded, but text readable and complete. 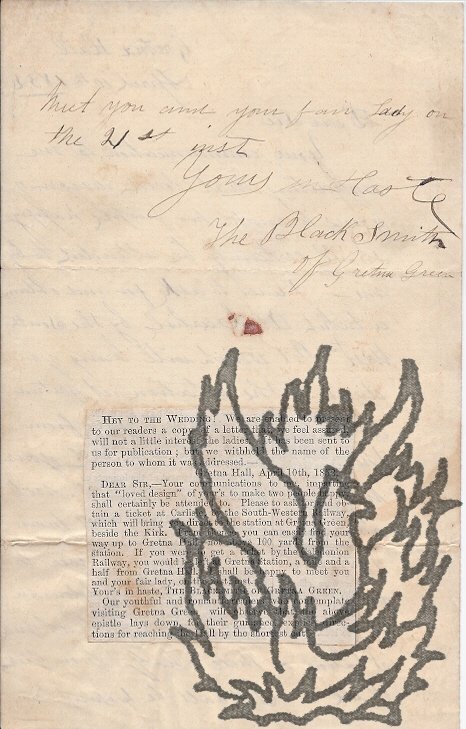 A letter or spoof letter from (or purportedly from) "The Blacksmith of Gretna Green", with newspaper clipping attached giving the text of this letter and commenting on it. Undated [1840s? 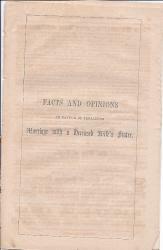 ], and without publication details [English]. Each copy is identically printed, on a piece of paper roughly 22.5 x 19.5 cm. Title and 56 lines of text (ending 'S. F.'), within a decorative border. Three of the four have a lightly-embossed stationery crown mark in a top corner. All four with text clear and complete, and in good condition, on lightly-aged and creased paper. Begins 'HAVING heard thou art shortly to enter a garden enclosed, and knowing thou art at present a stranger to this garden, permit an old friend to give thee an account of it. On a piece of green paper roughly 22.5 x 19.5 cm. Title and 56 lines of text (ending 'S. F.'), within a decorative border. Lightly-embossed stationery crown mark in top left-hand corner. Text clear and complete. In good condition, on lightly-aged paper with creasing to bottom righ-hand margin. Begins 'HAVING heard thou art shortly to enter a garden enclosed, and knowing thou art at present a stranger to this garden, permit an old friend to give thee an account of it. I have travelled every path and part thereof, and know the productions of every kind, it can possibly yield. Dimensions of print roughly 13 x 17.5 cm. On original grey paper windowpane mount (22 x 28.5 cm). Engraved label (3 x 12.5 cm) beneath the print, with small remarque-style Dimensions of print roughly 20 x 14.5 cm. On original grey paper windowpane mount (34 x 24 cm). Engraved label (5 x 19 cm) beneath the print. Worn and discoloured. 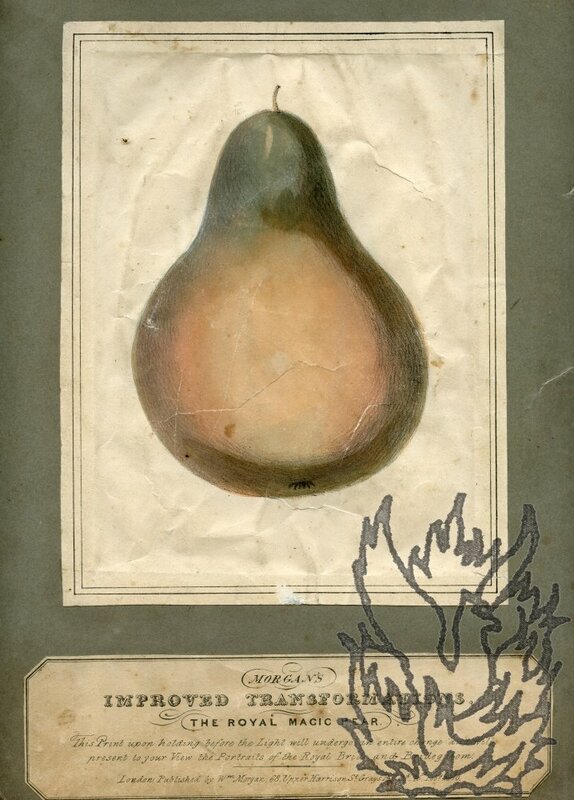 An usual and attractive item, with a simple picture of a pear which transforms into a portrait of the royal couple, under drapes, when held up to the light.